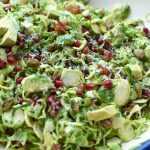 Shaved Brussels Sprouts salad loaded with bacon, avocado, pistachios and pomegranate arils with a soft grating of parmesan cheese. This salad is super good! Hiding under all those amazing salad ingredients is shaved Brussels Sprouts, believe it or not. We usually love to Brussels Sprouts roasted at a high temp in the oven, but did you know that served raw, Brussels Sprouts are really good for you? They are high in vitamin C, vitamin K and loaded with antioxidants. The awesome thing about Brussels Sprouts in a salad is that the salad tastes great leftover for lunch the next day. It’s not like spinach that wilts when tossed with a salad dressing. Because Brussels Sprouts are in the cabbage family they hold up great and stay crunchy with the salad dressing. You can slice or shave them thinly with a sharp knife. 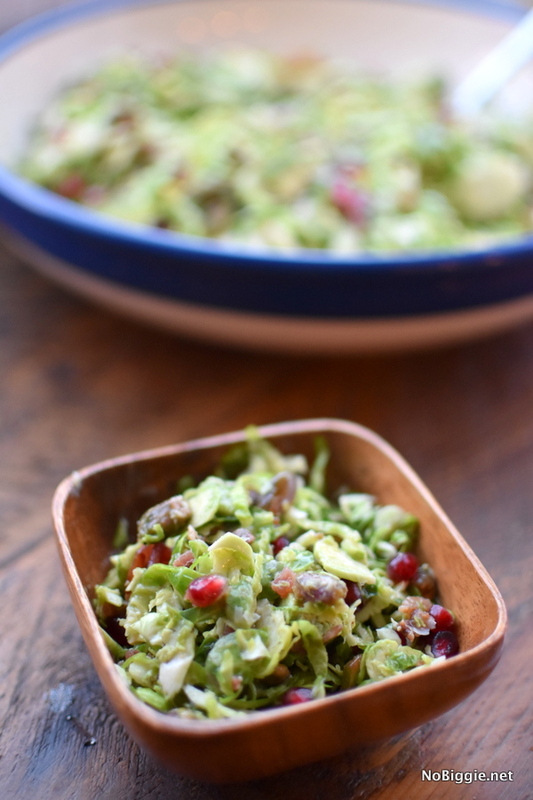 When you start with shaved Brussels Sprouts as the base for your salad, what you add next is that fun part! 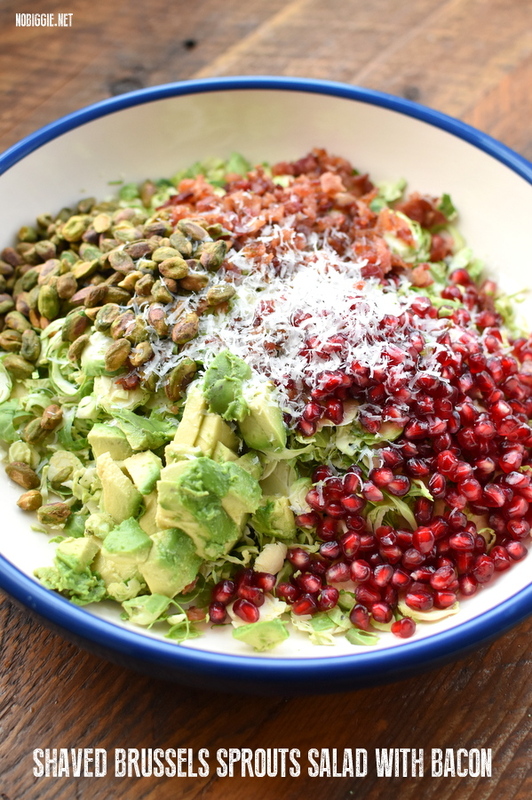 When pomegranate is in season, we love fresh pomegranate arils, roasted salted pistachios, chopped avocado and crispy crumbled bacon. We love the bag of cooked crumbled bacon from Costco. It’s a big time saver. Literally this salad is so easy. prepare all ingredients before assembly. 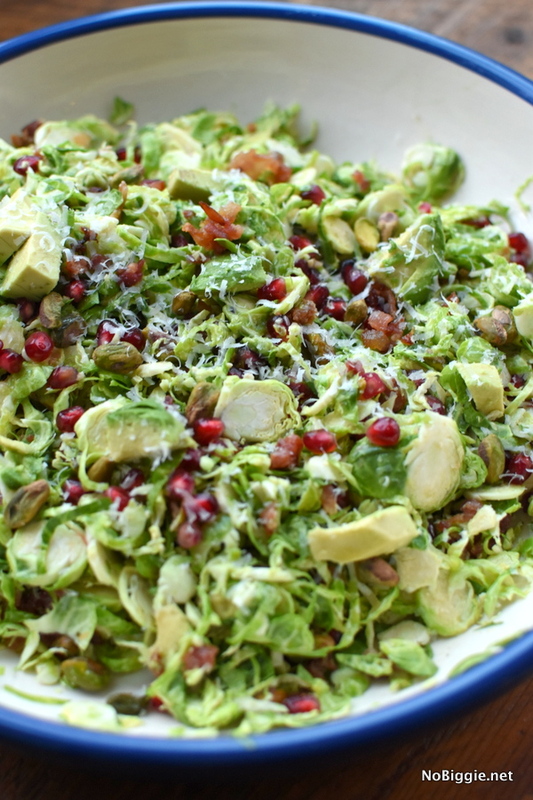 De-seed the pomegranate, shave the Brussels sprouts, have the bacon cooked and crumbled. We love the look of all the ingredients grouped together before tossing it. It looks so beautiful like this. If you plan to bring this salad with you to a gathering, it’s nice bring the salad with you like this then add the dressing and toss it just right before serving. This salad is so easy to throw together. It makes the best lunch or a fancy salad to serve along side a nice holiday dinner. Do you have a microplane grater/zester? It’s usually used to zest citrus, but we love it for hard parmesan cheese. It grates the cheese perfectly for this salad. 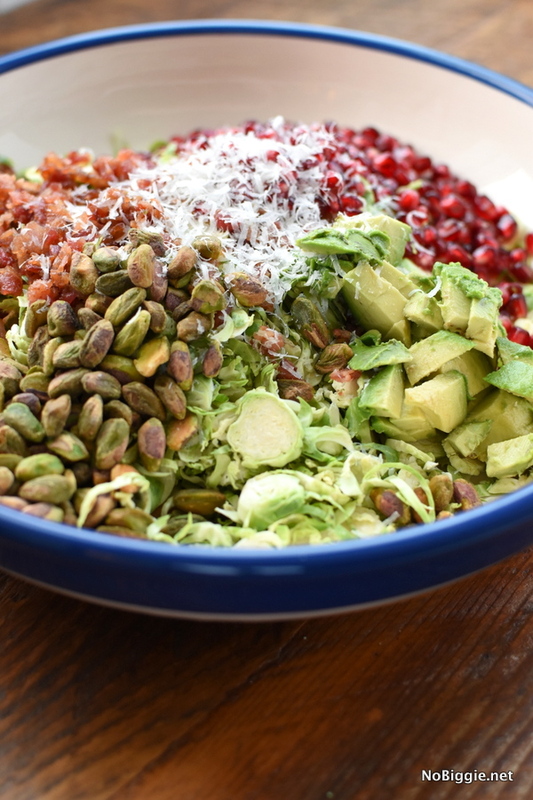 Shaved Brussels Sprouts Salad with bacon, pomegranate, avocado and roasted salted pistachios topped with parmesan cheese. This salad is so easy and so good! To start, shave the Brussels Sprouts. We used a food processor to shave them, with the slicing blade attachment. You can also buy them in a bag already shaved. Place the shaved Brussels Sprouts in a large bowl. Add the cooked and crumbled bacon, pomegranate arils, diced avocado and pistachios. Garnish with a fine grating of parmesan cheese and season with little salt and pepper. When ready to serve, add the salad dressing over the salad and toss to combine. We love Olive Garden's Italian Dressing. If you cannot find it in stores near you, feel free to use your favorite Italian salad dressing in its place.